Fans were rightfully astonished when the inaugural issue of the rebooted Ship’s Log fan club magazine arrived in their mailboxes in early August. In a bid to boost club membership, Yamato Crew supersized this issue and made it available to all new applicants. At 108 pages, it was squarebound and overloaded with content. 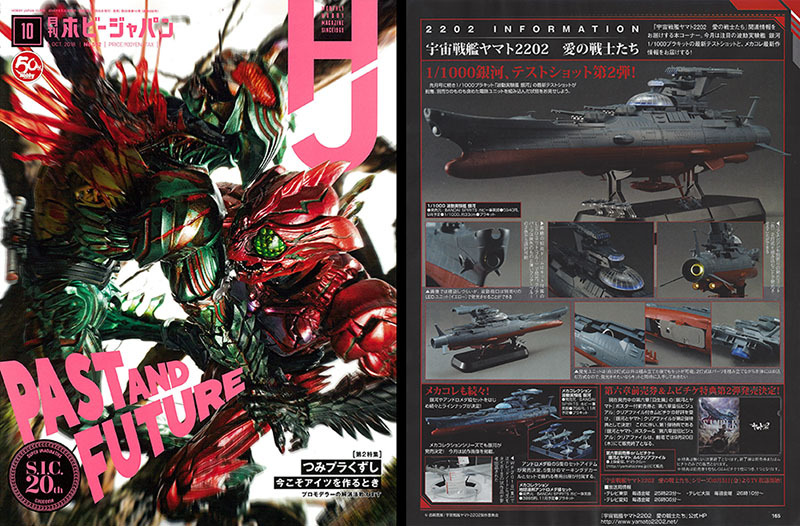 The first 40 pages echoed Ship’s Log with similar coverage: new character, mecha and production art (with the first tantalizing glimpses of Chapter 6), an interview with Mecha Designer Junichiro Tamamori (read it here), and a few backup features. 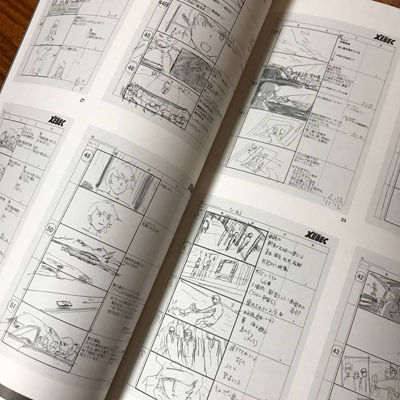 The remainder of the magazine was given entirely over to production materials: design work from the end of 2199/start of 2202, and the complete script and storyboards to 2202 Episode 2. It is not known yet whether subsequent issues will be this large, but it is clear that Yamato Crew is looking to expand the fan club. Three levels of membership were introduced with different enticements to match your particular devotion. Gold level (topping out at about $300 a year) offers a magazine subscription, various trinkets, and priority event notifications. For example, “Yamato Fest 2202” which is scheduled to take place in February – very likely marking the premiere of Chapter 7. More news on this as it approaches. In a more visible bid to attract new members, the Yamato Crew website completely changed formats with a more modern, aggregated design. See it right now! On this day it was officially announced that Yamato 2202 was scheduled to debut on late-night TV in Japan Friday, October 5. Why is this significant news outside Japan? 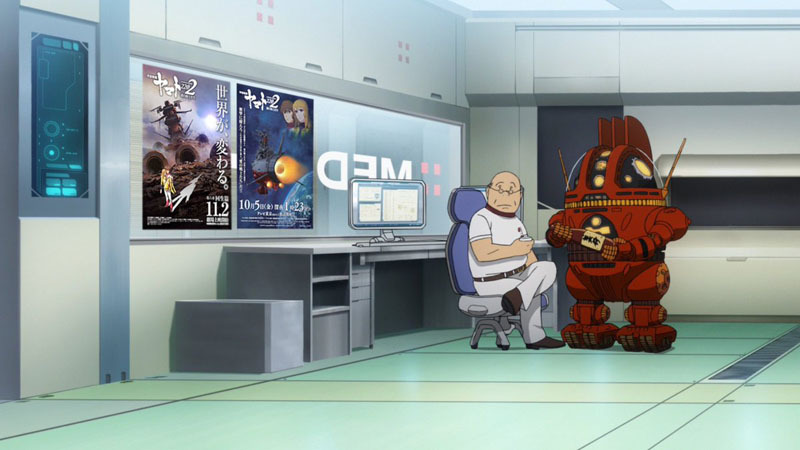 Because when 2199 made its TV debut, it led to a healthy uptick in merchandising sales, particularly for model kits. Thus, it has also been announced that we can look forward to a surge in Bandai models after the debut, and hopefully other things as well. 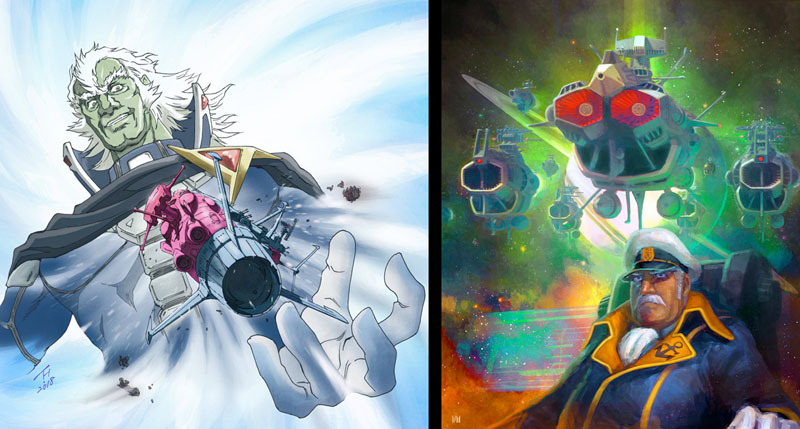 The image at right was released as a poster via Bandai/Namco. 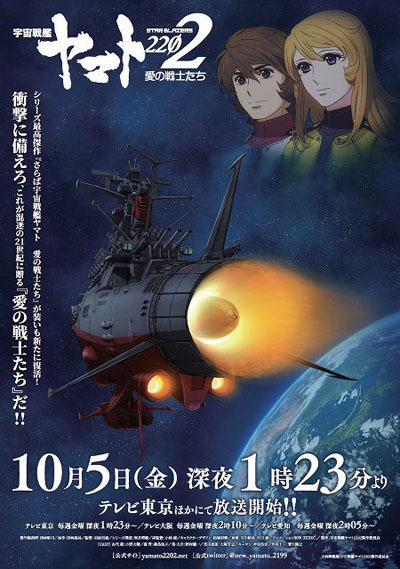 A week after this announcement, Yamato Crew put out a call for volunteers to help publicize the news by distributing the poster in their local area. This was an interesting callback to the seminal year 1977, when Office Academy asked fans to do the same in a guerilla marketing campaign for the first Yamato movie. Participants in this campaign would receive both the TV poster and another to promote Chapter 6 in theaters. 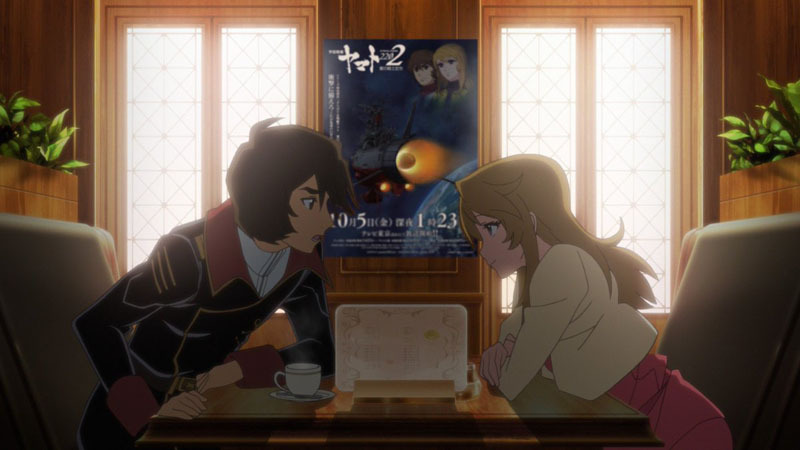 The campaign started on August 13, when these images of posters added to anime scenes were published by Yamato Crew on Twitter. With the summer 2018 Comiket just a few days away, Yamato Crew announced that they would set up a booth to sell merchandise. They would share floor space with other such booths in a co-op with a company called Frantiq Keywest. They published a list of products that would be sold on-site; some remaindered 2199 swag along with a few newer 2202 items. Customers would walk away with a custom Yamato bag. See a complete gallery here. 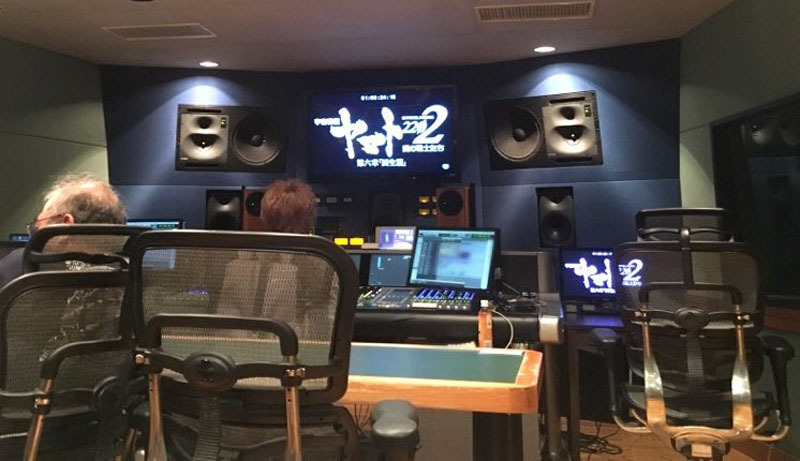 Whenever the Yamato Production Committee tweets a photo from an editing bay, we know something cool is coming. The caption for this pic read simply, “Chapter 6 special item coming soon. Please look forward to it!” We would only have to wait two more days for the results. 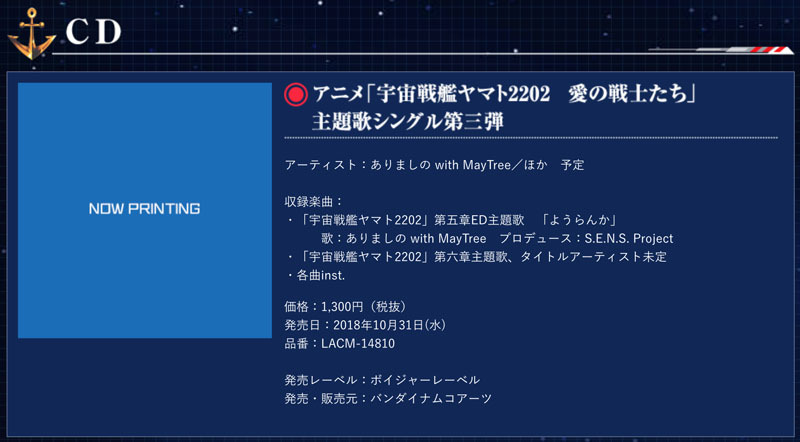 The next entry into the Yamato 2202 music library is scheduled to arrive October 31, just ahead of the Chapter 6 premiere in theaters. It will include the end themes from both Chapters 5 and 6 (both vocal and non-vocal versions). The end song for Chapter 5 was performed by MayTree, but the performer for Chapter 6 is not yet announced. 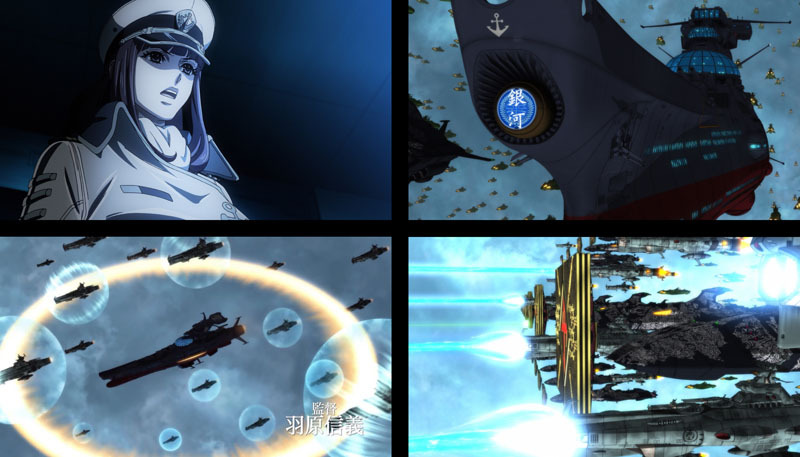 The first 30-second teaser for Chapter 6 has Space Battleship Ginga [Galaxy] front and center along with some alluring snapshots of what will undoubtedly be a very dramatic story. See it on Youtube here! 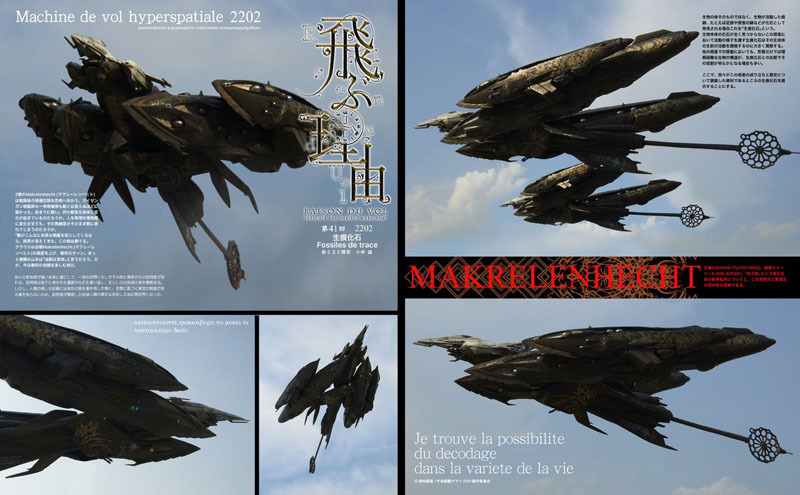 Makoto Kobayashi (2202 mecha designer/assistant director) contributed six pages to this issue, taking the Czvarke fighter in an unexpected direction and offering a glance at what may be the Earth fleet’s next Andromeda-class ship. It can be seen at upper left, bearing a modified bridge and the name Aquarius. We’ll have to wait and see whether this is part of the story or merely artistic whimsy. Comic Market 2018 Summer took over Tokyo Big Site (a massive convention center on Odaiba island in Tokyo Bay) and Yamato fans planted their flag once again. 2202 made a very respectable showing in the doujinshi [fanzine] realm with entries from new and veteran fans alike. Yamato Crew’s booth extended its reach with two costumed ambassadors dressed in pseudo-Yuki and pseudo-Yamamoto cosplay. The lovely cosplay ladies at Comiket were tasked with handing out promotional materials, including this comprehensive flyer to promote 2202 on TV, in theaters, and home video. On the other side of the globe, Funimation got in on the action with a one-of-a-kind live webcast on Youtube. 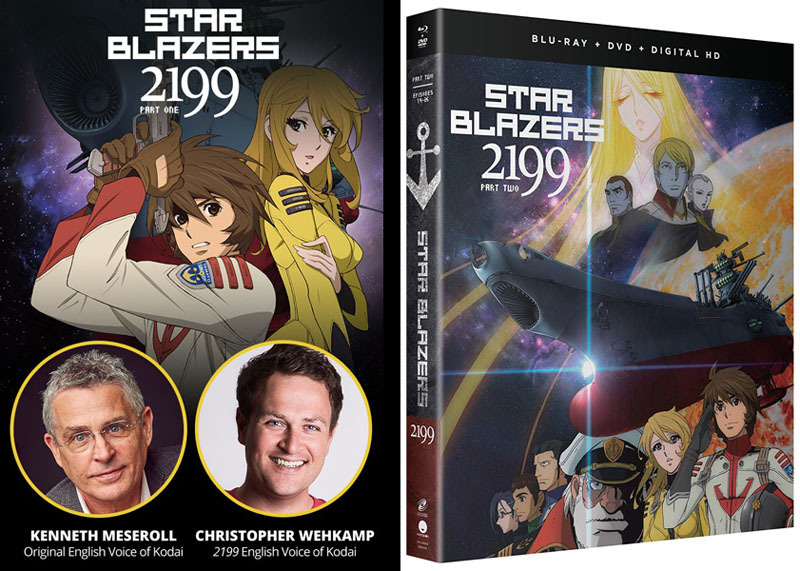 Their streaming version of Yamato 2202 went on hiatus with Episode 13 on August 1, so they gave fans a bonus in the form of a sit-down interview with two actors: Ken Messerol (the voice of Wildstar on Star Blazers) and Chris Wehkamp (the voice of Kodai on 2199). They compared notes on their respective roles and took questions for about 45 minutes. See it for yourself on Youtube here! 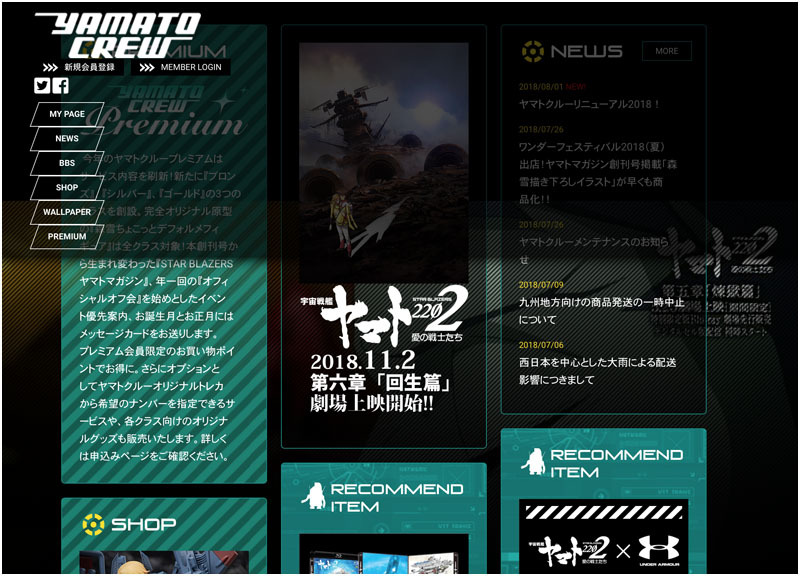 The next, day, Funimation announced that the second Yamato 2199 DVD/Blu-ray box set will be released November 6. Get your preorders in now at either Funimation or Amazon! Another crew member joined the elite ranks of Hero’s Hill when voice actor Unsho Ishizuka died of esophageal cancer on this day. 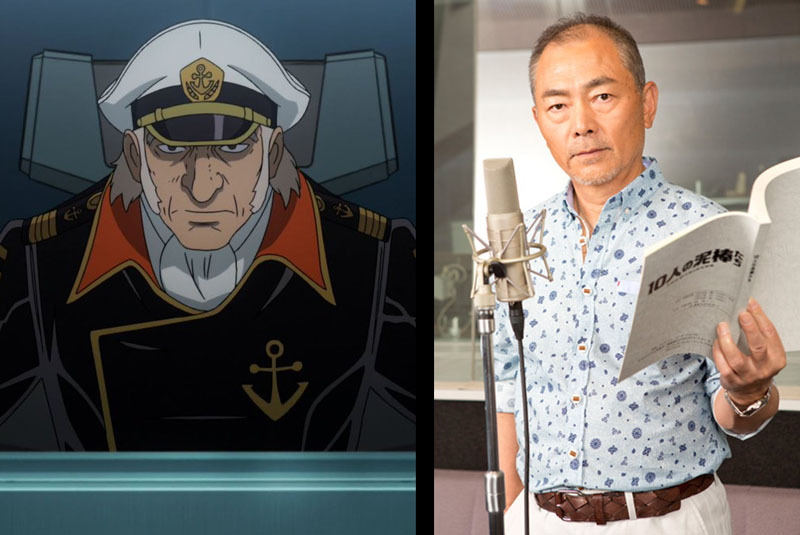 As the voice of Ryu Hijikata on Yamato 2202, he will be particularly missed. According to Series Director Nobuyushi Habara, his very last performance was for Episode 20, to be heard in Chapter 6. We’ll just have to wait and see how the character advances from there. Ishizuka’s career was long and incredibly dense with roles in Attack on Titan, Berserk, Cowboy Bebop, Dragonball Z, Full Metal Alchemist, Jojo’s Bizarre Adventure, Macross Plus, various Gundams, Pokemon, and far more. See the announcement on Anime News Network here and be boggled by his enormous list of credits here. 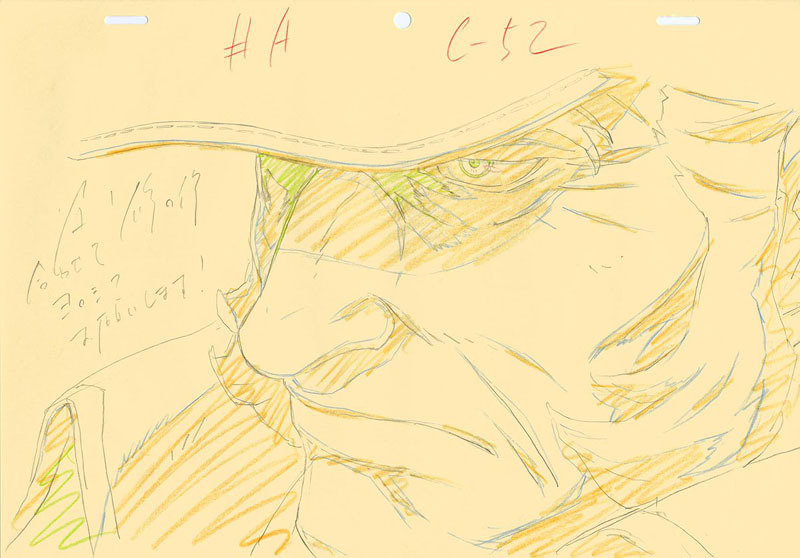 Six days later, 2202 Character Designer Nobuteru Yuuki paid his respects on Twitter with this layout image of Hijikata and regrets over losing such a dignified voice actor. As some voices are silenced, others are brought to life. 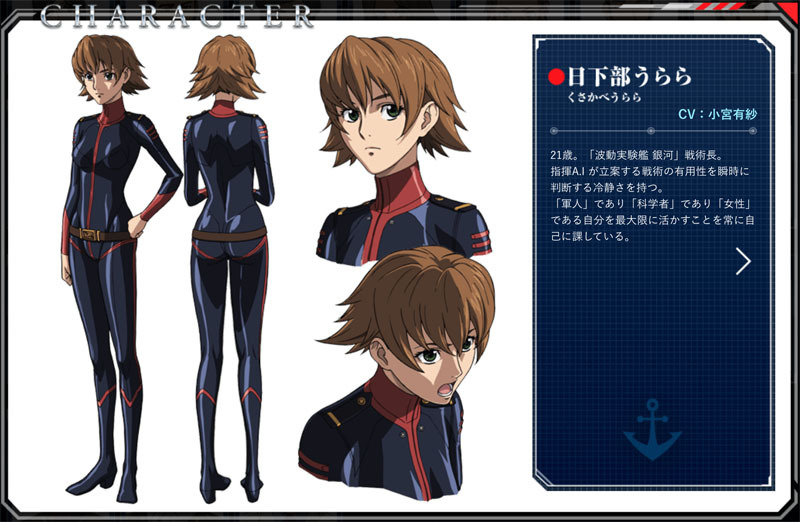 Two new female characters (both crewmembers of the new warship Ginga) were announced on this day, and the visibility of one particular voice actress caused the story to be picked up across a wide swath of entertainment media. 36 years old. First mate on the “Experimental Wave-Motion Ship Ginga.” She is a person of good understanding who supported Saki Todo in her youth and continued to support her in both public and private affairs when she took office as a captain. She treats the crew with a severity that shows not even a hint of her original gentle personality. Digging down into the old Yamato and rebuilding it is difficult for everyone involved, but my inner joy is beyond measure. I have the role of Kanzaki on the ship called Ginga, and I was amazed when the director told me about the purpose and resolve of the crew. Please check it out. 21 years old. Tactical chief on the “Experimental Wave-Motion Ship Ginga.” Her preternatural calm allows her to instantly judge the quality of tactics developed by the AI system. She always pushes herself to do her absolute best as an officer, a scientist, and a woman. I will be playing the role of Urara Kusakabe, who serves on the crew of the Ginga. I couldn’t believe it when my manager told me I would be appearing in Yamato 2202, and after I received the script I was unable to sleep from the nervousness of appearing with such great veterans. I will pay close attention to Ginga, the new ship that appears for the first time, and I’d like you to see it while feeling the great power of the big screen in a theater. 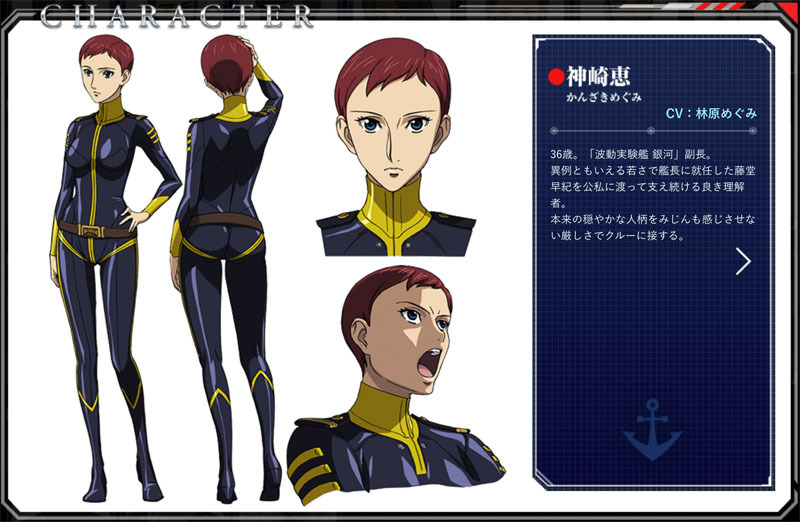 See the entire Yamato 2202 character guide here. Advance tickets for Chapter 6 have been available since the release of Chapter 5 in May, with a clear file and poster available as bonus items. 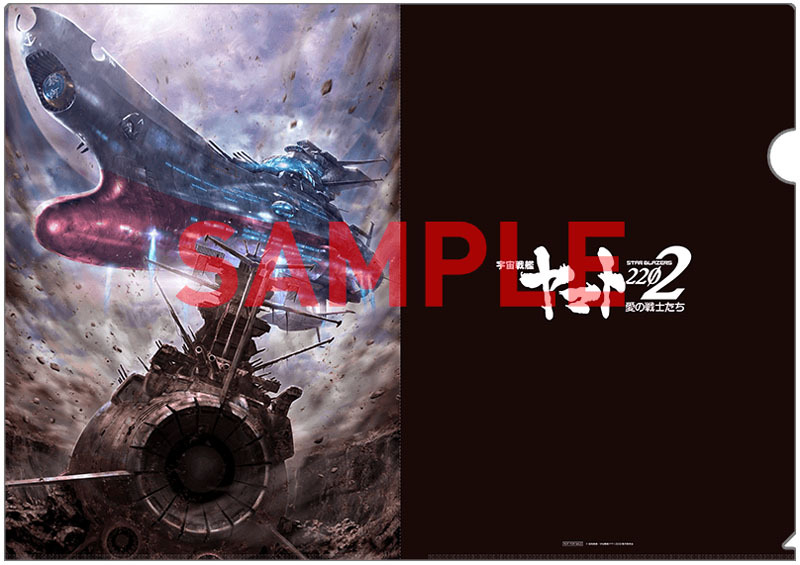 Both will be discontinued on September 21 with this new clear file taking their place, available until supplies run out. 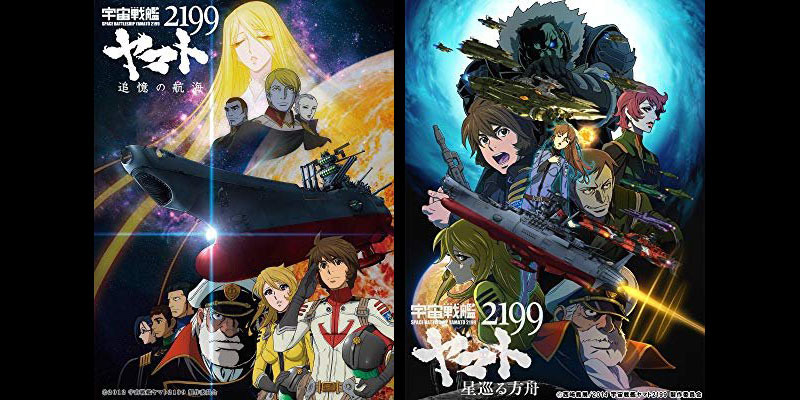 After years of being restricted to home video, broadcast, or limited streaming, it was announced on this day that Yamato 2199 (Series and both movies) would become available on an unlimited basis via all major platforms in Japan from September 5. This would include Amazon Prime, Bandai Channel, Hulu, and many more. Kentaro Haneda’s Yamato Grand Symphony was the musical postscript to the original Yamato production years, a magnificent live performance that was recorded for both LP and video in 1984. It was rereleased many times in the years since, and was rerecorded from start to finish for Yamato Resurrection in 2009. Kentaro Haneda, who had a rich and extraordinary musicality, completed this masterpiece wholeheartedly. 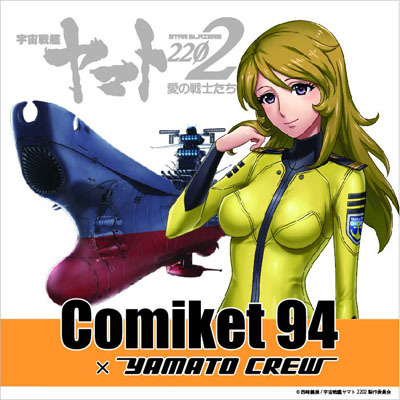 In the time that has passed since its premiere (1984), the beauty and dynamism of this pure symphony has become a Japanese treasure with kindness and strength, independent from the anime called Space Battleship Yamato. I cannot confirm whether Mr. Haneda intended it from the beginning, but the original title of the handwritten score was Symphony Yamato. At its premiere, the ending of the fourth movement was changed at the strong request of Producer Yoshinobu Nishizaki, but in this performance we play it with Mr. Haneda’s original ending. Mr. Haneda, Mr. Miyagawa, and Mr. Nishizaki have been gone for a long time, but I hope you will feel the dreams, hope, and energy that was infused into this music back in the days when everyone was shining and full of vitality. C3 AFA [Anime Festival Asia] is an all-encompassing convention for anime, manga, novels, games, model kits, and everything else that makes Japan great. 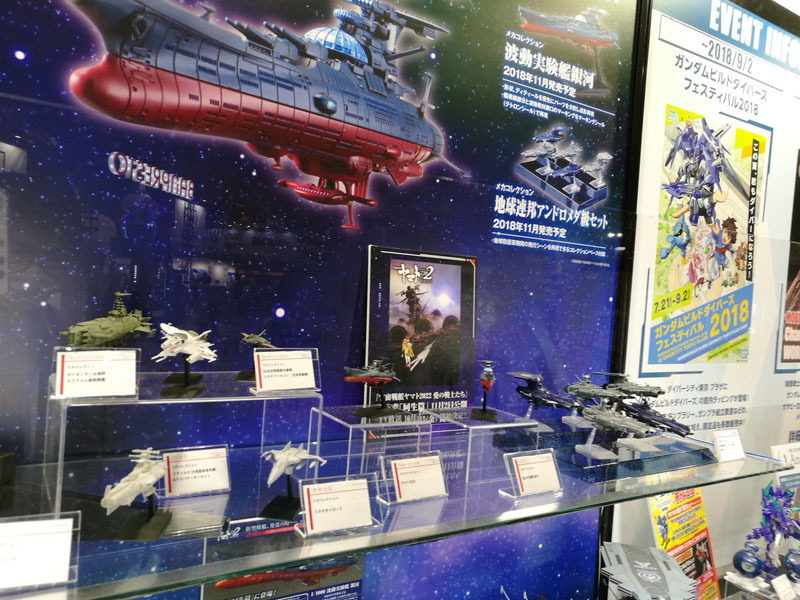 Attendees got another chance to see new and upcoming Bandai model kits at this hobby show, or take in another viewing of Yamato 2202 Chapter 1. For the rest of us, there is Twitter. 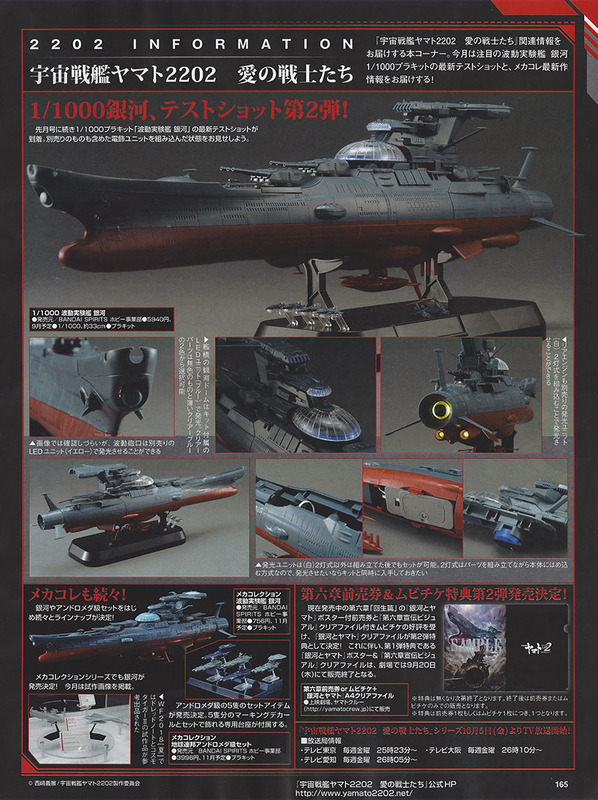 Only one page of the magazine was devoted to Yamato in this issue, delivering new “test shot” photos of the forthcoming 1/1000 Ginga model kit, scheduled for release September 30. 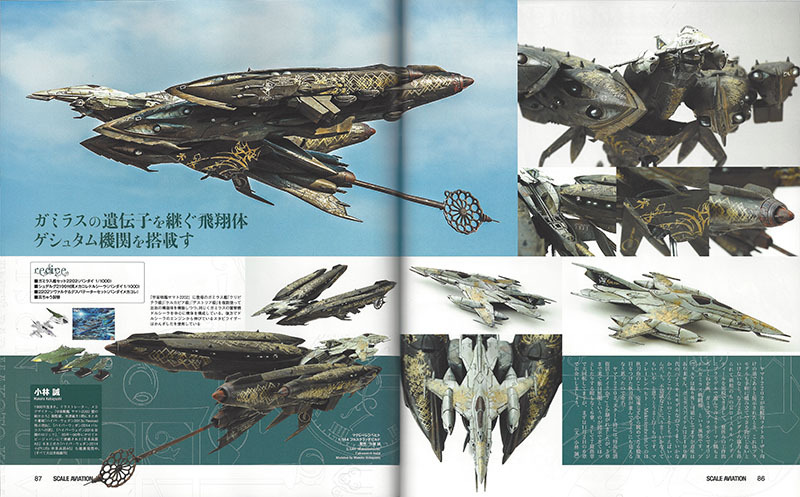 At that point, it will be the first major Yamato ship sold as a model prior to its launch in the story. See an enlargement of the page at the end of this report. 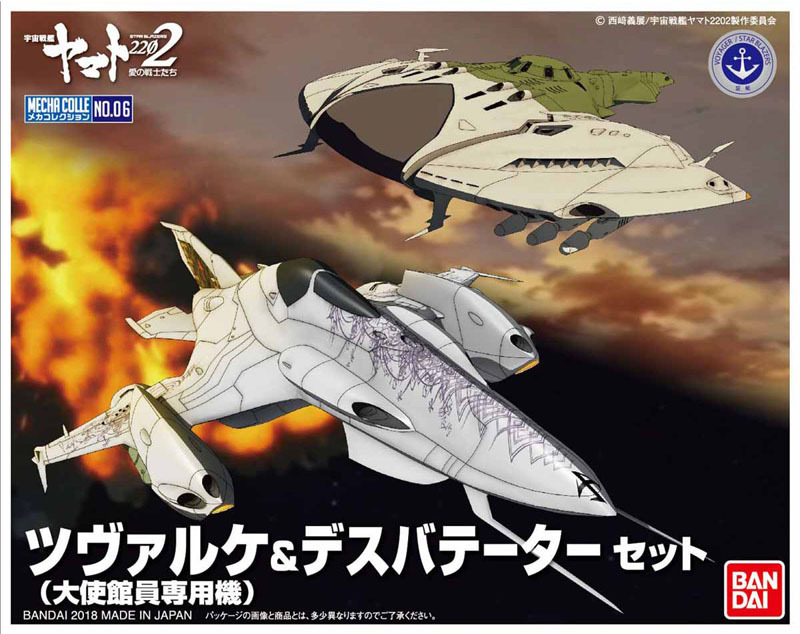 In other model kit news, new additions to the Mecha Collection were confirmed for November release: the Ginga (again) and a set of all five Andromeda-class capital ships (mostly atomized in Chapter 5, as we all knew they would be). 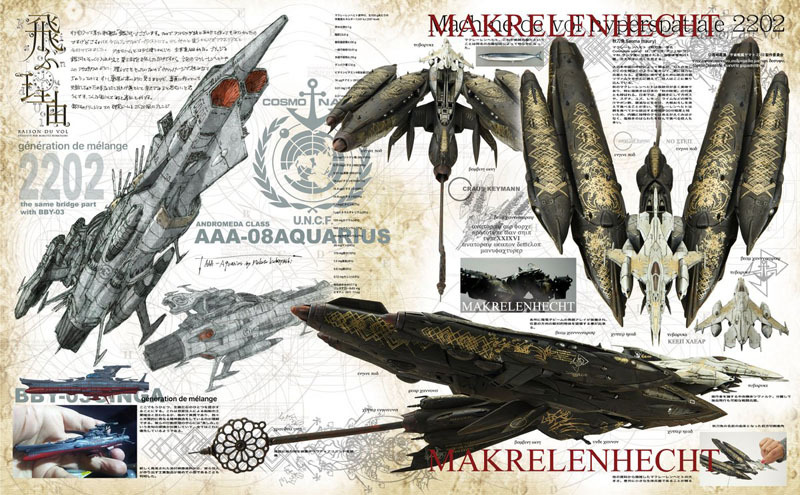 The latest release in the Mecha Collection was this two-fer containing ships that were previously available only as bonus items with 1/1000 models: the Garmillan fighter Czvarke (recast in Keyman colors) and a Gatlantis Deathvatator. Other than his semi-regular contribution to Scale Aviation magazine, Mr. Kobayashi was quieter than usual in the month of August, but still had some new things to share. See them here. The wait between chapters 5 and 6 is the longest yet, and some fans fill it up by making their own anime featurettes to keep us all entertained. For those of us on the wrong side of the language barrier, they’re short, well-made, and don’t require translating. With the passing of voice actor Unsho Ishizuka, a fair amount of fan art commemorated Admiral Hijikata and the Andromeda. But there was plenty else to enjoy as well. See a character gallery here and a mecha gallery here. 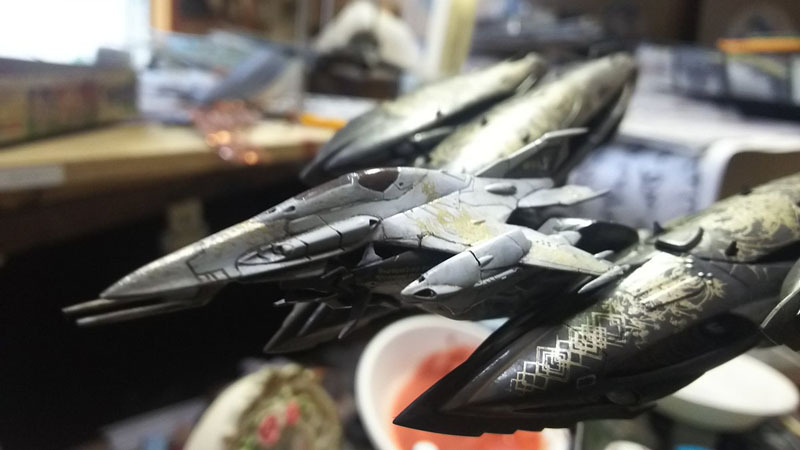 Most of the modelers who posted their projects on Twitter in August offered interesting side-routes into the world of other modeling materials such as wood and paper. See their latest achievements here. 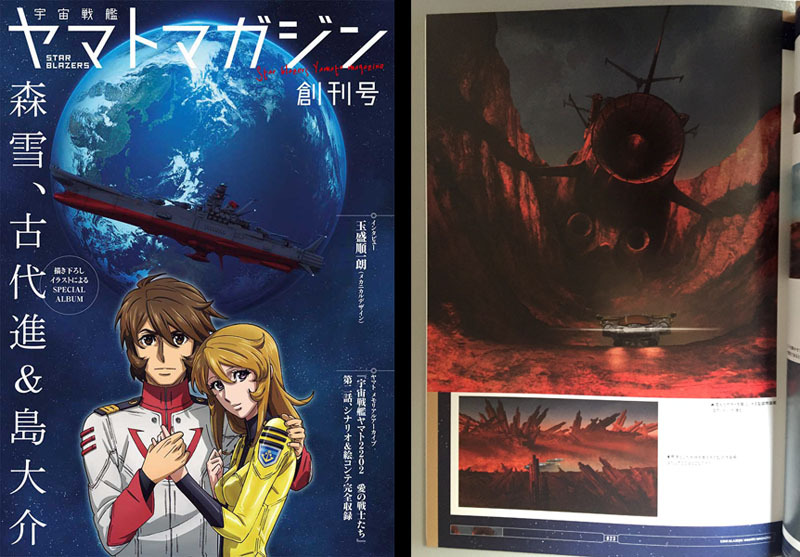 This entry was posted in Yamato 2202, Yamato 2202 Reports by TimEldred. Bookmark the permalink.